2 folding drop-leaves allow you to adjust the table size according to your needs. You can make your chair more comfortable and personal by adding a chair cushion or pad in a style you like. May be completed with HÅLLÖ, EKERÖN or TÅSINGE chair cushion 40x40 cm or NÄSTÖN chair pad 40x40 cm. Table (length 77 cm, min. length 20 cm, max. length 133 cm, width 62 cm, height 71 cm). Chair (width 45 cm, depth 58 cm, height 87 cm, seat width 40 cm, seat depth 41 cm, seat height 44 cm). 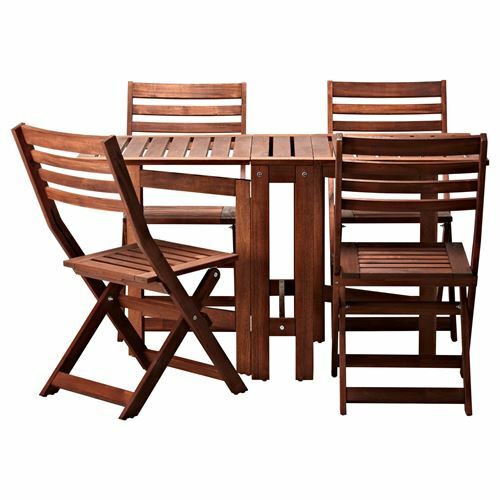 Use VÅRDA wood stain, outdoor use when re-staining the furniture, sold separately.